Kornet-D is a new Russian ATGM platform based on the GAZ-2975. 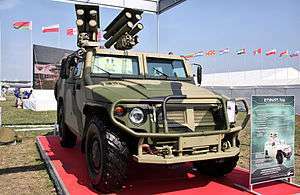 It employs Kornet-EM missiles in both tandem-HEAT or thermobaric variants. It is capable of launching a salvo of two missiles less than a second apart, either at a single target or at two different targets simultaneously. The two-missile salvo is intended to either defeat active protection systems or to ensure a single tank's destruction in the absence of an active protection system. Kornet-D is capable of a pseudo-fire-and-forget function, in that the fire control system of the missile launchers automatically tracks and guides each missile to their assigned targets without an operator's aid. The operator may switch targets or override missile guidance during the missile's flight. The system can be controlled remotely at a distance of 50 meters.